Several years ago, I examined the enrollment trends in industrial arts/technology teacher education programs from 1970 to 1990 ( Volk, 1993 ). The analysis indicated university programs and student enrollment numbers suffered a precipitous decline from the 1970 levels. For instance, by 1990 the number of students graduating with industrial arts/technology education teaching degrees were less than one-third the number graduating twenty years earlier. An examination was also made as to the detrimental effects non-teaching options such as industrial technology had on teacher preparation program numbers. As a result of this analysis, it was estimated that if the downward trend continued, the demise of the technology teacher preparation profession would occur near the year 2005. This doomsday scenario for technology education programs was not meant to be fatalistic. Rather, it was hoped this bold prediction would challenge the profession and serve as a catalyst for more discussion on the health and direction of the programs. To re-examine this original prediction of the profession's demise, more recent data were collected using a similar methodological approach. The Industrial Teacher Education Directory ( Dennis, 1995 ) was again used to compile the number of graduates from US technology teacher preparation programs. This next five-year interval was combined with the original data showing the graduation rates and projected trend (see Figure 1). The data for 1995 indicated less than 1300 graduates received technology education-related degrees, adding support to the original projection. Influences There are several factors which may be influencing the future trends in technology teacher programs. The shift in teacher recruitment emphasis, the decreasing pool of professionals actively debating issues, and the potential for a diminished role for technology education as a stand-alone subject each have the capacity to influence the character and survival of the programs. Although the data indicated the total number of students receiving bachelor's degrees has been falling significantly, those actually obtaining teacher certification through alternative routes has not been ascertained. For instance, with alternative certification programs such as the Military Career Transition Project offered at Old Dominion University, a number of new teachers entering the profession would naturally be greater than reported in the Directory . But, to what degree these options are meeting the actual needs of schools to have qualified technology teachers remains of question ( Young-Hawkins, 1996 ). Besides the potential that recruiting a cohort of technology teachers through non-degree options may perpetuate still-more skewed demographics in technology education (i.e. ; male, ex-military, technically oriented as opposed to arts and humanities), a program survival issue concerns the role and mission these options have within degree-granting institutions. Given the reliance on determining faculty and program continuation based on Full Time Equivalency calculations and numbers actually graduating, can technology teacher preparation programs viably exist, relying on such non-degree granting initiatives? The pool of professionals actively debating technology education issues may also be decreasing. Program closures and the small number of students graduating from existing programs have reduced the university professionals actively concentrating their efforts on technology teaching matters ( Evans, 1992 ). Wenig commented on this reduced professional role by lamenting the Council on Technology Teacher Education's gradual loss of "membership, power, and influence" in the last 10 to 20 years (1995, p. 529). Similar reductions in professional discourse is further illustrated by the recent collapse of the annual Technology Education Symposium series, decreased attendance at regional meetings such as the Southeast Technology Education Conference, and the minimal participation in committees at ITEA conferences, resulting in the abandonment of long-standing committee structures in favor of more-targeted task groups. University faculty housed in many programs will more likely shift their research and publication focus to non-teaching industrial technology areas; a reflection of their increased interests and responsibilities ( Volk, 1993 ). Sanders (1995) discussed one aspect of this change in professional dialog. He noted how The Journal of Epsilon Pi Tau , originally created for teachers and teacher educators, increased the number of technical articles and eventually changed their name, in response to more-technical and less education-centered readership. Given the lack of opportunities in recent years for young professionals to enter university positions ( McAlister, 1993 ; Scott & Buffer, 1995 ), ample discourse which compliments or challenges the existing (and more-mature) status quo may be waning. The corresponding decrease in doctoral degrees granted and diminished new professional opportunities in technology education teacher preparation programs does not afford the incentive or opportunity for new ideas to be promoted. Compounding this lack of available "fresh" dialog, the age of technology teachers has been increasing. Through data supplied by International Technology Education Association (personal communication, August 14, 1996), 14 percent of ITEA's members in 1981 were in the 18-25 year old age group, while in 1995 only 8 percent were in this category. What this suggests is that the future source for new higher education professionals experienced in teaching technology education may be seriously jeopardized. Finally, as a stand-alone subject, trends have not been encouraging. With programs closing in public secondary schools ( Scott & Buffer, 1995 ) and subjects such as science using much of the equipment, activities and concepts "unique" to technology education, the need for a separate discrete subject has been reduced. Granted, initiatives encouraging technology education in elementary schools and the Technology for All Americans project may increase public awareness of the subject, but the need for producing teachers specialized in the discipline may not be forthcoming or necessarily required. It is quite possible that the subject of technology will be introduced as a one-time experience for those preparing to be elementary teachers, hardly requiring a full technology department to support the effort. Also, should the concepts outlined in the Technology for All Americans Standards be incorporated into existing science, mathematics and history curriculum, any justification for a unique facility, curriculum and teacher dedicated to technology is moot. Is This The End? The likelihood that the demise of the technology teacher preparation programs will occur around the year 2005 is not without potential revision. First, economic incentives might encourage more young people to enter the technology education teaching profession, as public awareness responds to teacher shortages. Second, through political action via education departments, the importance of technology education being a required subject for all secondary students may develop. Already this has happened, with the state of Maryland leading the way. Finally, from students' experience derived through innovative technology education programs, a true desire to teach the subject for personal satisfaction, interest and motivation may develop. In some programs, the declining numbers have started to level off or even turn around. However, this trend is few and far between. More questions must be posed in order to find possible solutions to the declining numbers. What was so unique about the students and programs of the 1960s and 1970s that the attractiveness, energy, enthusiasm and numbers were at its zenith? Why are students not considering a career as a technology teacher now? Why does the public, including other educators, not fully appreciate or understand the need to learn about technology? Is the leadership of the profession not tolerant enough or accepting of more-traditional programs that still attract student interest? What is being done right in those few technology teacher preparation programs that are succeeding? It is very doubtful technology teacher preparation programs lost will ever return, and that very few new programs will have the opportunity to start, given the retrenchment efforts and budget cuts in higher education. We must therefore give serious attention to the issues influencing the downward trend, for the survival of the technology teacher profession is at stake. For as the numbers indicate, if we do not address the issues, soon we will be going... going... gone. References Dennis , E. A. (Ed.). (1995). Industrial Teacher Education Directory (34th ed.). South Holland, IL: Goodheart-Willcox. Evans , R. N. (1992). The state of the union in industrial, technical, and technology teacher education. Journal of Industrial Teacher Education, 29(2), 7-14 . McAlister , B. K. (1993). A career on the edge: At a fork in the professional road. Journal of Industrial Teacher Education, 31(1), 102-104 . Sanders , M. E. (1995). Professional publications in technology education. In G. Martin (Ed.). Foundations of Technology Education , 44th Yearbook of the Council on Technology Teacher Education. NY: Glencoe Division, Macmillian/McGraw-Hill. Scott , M. L. & Buffer, J. J. (1995). Undergraduate and graduate technology education. In G. Martin (Ed.). Foundations of Technology Education , 44th Yearbook of the Council on Technology Teacher Education. NY: Glencoe Division, Macmillian/McGraw-Hill. Volk , K. S. (1993). 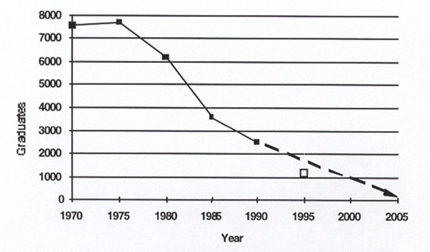 Enrollment trends in industrial arts/technology education teacher education from 1970-1990. Journal of Technology Education, 4 (2), 46-59 . Wenig , R. E. (1995). Technology education leadership. In G. Martin (Ed.). Foundations of Technology Education , 44th Yearbook of the Council on Technology Teacher Education. NY: Glencoe Division, Macmillian/McGraw-Hill. Young-Hawkins , L. (1996). Recruiting technology education teachers: Broadening the pool of talent. The Technology Teacher, 56 (2), 26-30. Kenneth S. Volk is Senior Lecturer in the Department of Engineering and Technology Studies at the Hong Kong Institute of Education, Hong Kong.